Despite the (admittedly partly true) stereotype of the miserable Parisian, I consider myself incredibly lucky to be living in a place where all of my needs are comfortably met. I lack not food, water, shelter, love, security, freedom and adventure, and sadly it’s only when headlines detailing the struggles others are facing in other parts of the world, that we selfishly realise how good we’ve got it. France, like most of Europe is deep in the midst of the migrant crisis, though it’s only through the media that we can begin to understand what difficulties others are living through. It’s easy to turn off the TV or computer, or put down the newspaper when those hardships become difficult to confront, and we’re all guilty of closing our eyes when concentrating on our own fortune is easier to bear. But turning the page is only temporary – above all, it’s important not to forget. I may live a life a million miles away from families who have lost their loved ones at sea in the hope of building a better life, but the recent images of tiny beings tragically washed ashore are impossible for anyone to ignore, regardless of how removed our own realities are. 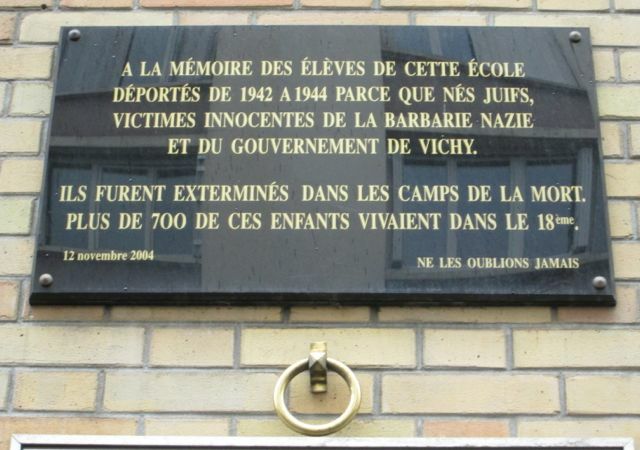 I could never hope to understand the torment of their plight, though thinking of such innocent young lives in such peril made me cast my mind to the children of Paris who have suffered throughout the years, plaques of remembrance scattered throughout the city meaning that we will forever be surrounded by their memory. 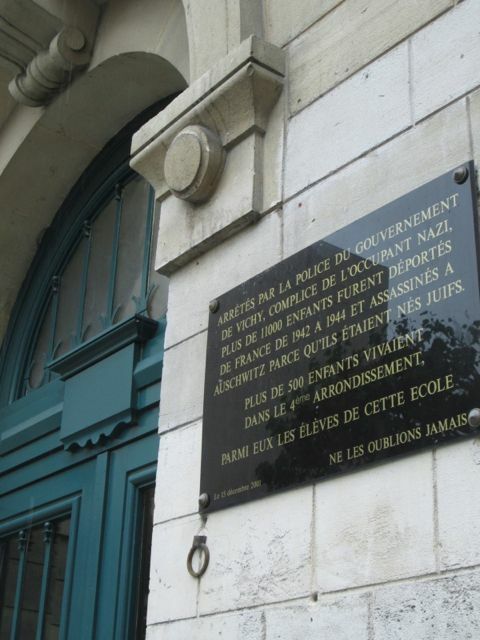 Walk around with your eyes open and you’ll soon likely encounter one of hundreds of the city’s schools, most proudly displaying a black marble plaque near the front entrance, usually accompanied by a large brass ring, and frequently a bunch of flowers. It’s easy to walk by without realising the significance, but look more closely, and you’ll see that the inscription pays homage to the thousands of Jewish children who were removed from their homes and schools during the horrors of World War II and shipped to concentration camps by the Nazis. 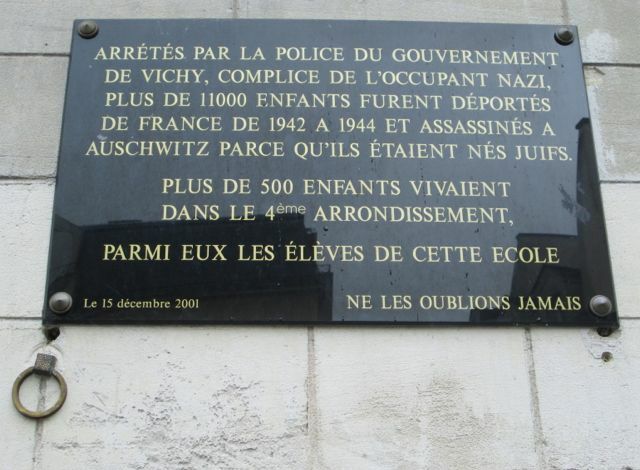 Some plaques detail individual names, some quietly remember the numbers lost in each arrondissement, and others point to the horrifying city-wide total of 11,000 children deported from France between the years 1942 and 1944. Even today floral tributes are often placed within the brass ring to show that even though such terrors have gone, they will never be forgotten. It may be beyond the powers of most of us to tackle the route causes of such needless suffering, but it’s at most important to us to remember what has passed, and those it has affected in a world where we have power to at least influence change. In a society when looking inward (often to the point of narcissism) has become more the norm, I find these plaques a sobering and poignant reminder to appreciate the freedom we have when others would give their lives for it, as is all too familiar in the past, and devastatingly, the present. Let’s hope one day we won’t need to remember such dark times in the first place.